Enlarged print edition now available! 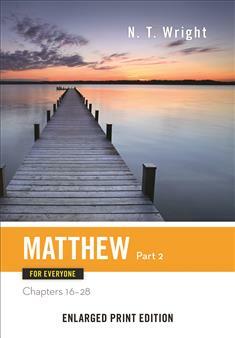 Tom Wright's eye-opening comments on the Gospel of Matthew and what it might mean for us are combined, passage-by-passage, with his fresh translation of the Bible text. Making use of his true scholar's understanding, yet writing in an approachable and anecdotal style, Wright captures the urgency and excitement of Matthew's Gospel in a way few writers have.